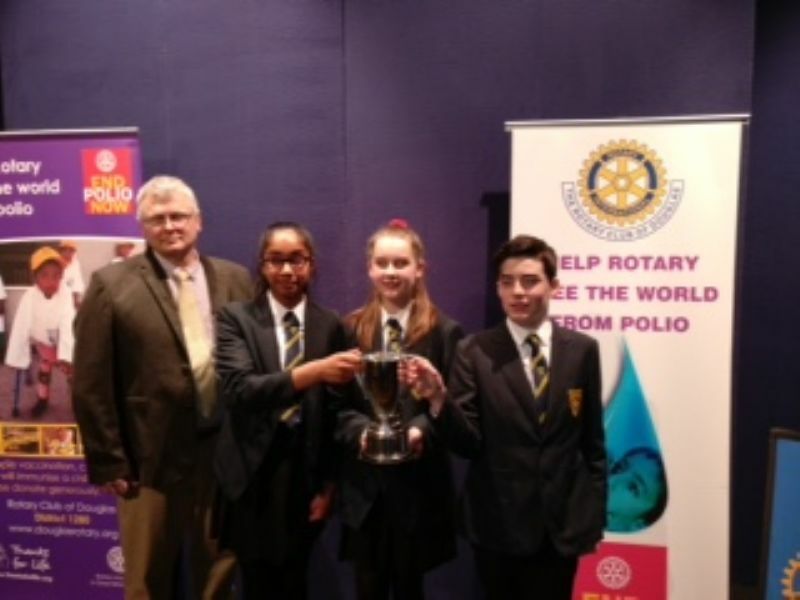 The Rotary Club of Douglass Youth Committee working in partnership with the Department of Education and Children organised the 55th annual competition to give pupils the chance to develop and demonstrate their skills in public speaking. All the schools had held an internal competition first to decide who would represent their school in the island wide events, so when it came to the finals those attending heard the best of a large pool of talent in two entertaining and thought provoking evenings. The winning team in the junior competition was St Johns Primary School. The team was ably chaired by Ealish Ayres. The main speaker Summer Rose enthralled the audience with a talk entitled If I were an animal I would be... surprising them with the answer ...a cockroach and Bel Hughes in her role thanked Summer for eloquently explaining the many reasons why. The winning team in the senior competition was Ballakermeen High School which as last years winners (and indeed 2016 winners as well) hosted the event. Successfully defending their winning position were Team Chairperson Brintha Yasodaran, main speaker Paulina Kurzydlowska who made clear her feelings on the beginning of the working week in her talk I dont like Mondays . Together with the vote of thanks Conor Harper they conducted a thorough debate on whether in the interests of well being and health care resources Mondays should be removed from the calendar. This year it was noticeable how pupils at both primary and secondary schools were skilled in thoroughly analysing and presenting subjects which are challenging and topical ranging from the nature and future of education in and outside the classroom, through Is artificial intelligence anxiety inducing or a helping hand? to how even the traumatic experiences of terrorist attacks can have a silver lining. Giving feedback from the judges Mrs. Anne Clark, who is Vice- Chairman of the Manx Music, Speech and Drama Festival, made it clear that not only the subject matter was important but also the clarity and confidence of presentation and the poise and interaction of all members of the team. Rotary Club of Douglas President Wayne Tomlinson commented that the high quality and variety displayed again this year meant that there was a particularly tough choice for the judges panel which he chaired. The winning schools each received a cheque for £500 and the 1st, 2nd and 3rd prize team members and individuals who made a special contribution received book tokens. The prizes were sponsored by an award from the Lockington Marshall Trust of which the Rotary Club of Douglas Charitable Trust is the Trustee and funds provided from the Department of Education and Children.